The recent leak of offshore financial records contains numerous examples of money moving into and out of tax havens via Western-world banks, or of those same institutions setting up accounts for offshore companies. Canada's big banks are right there in the thick of it. And in Canada, our banks play a role. Scotiabank's name appears 1,839 times in the leaked offshore files. Royal Bank comes up more than 2,000 times. CIBC is named in 1,347 leaked documents. The leaked records are full of examples of money moving into and out of offshore havens via Western-world banks, or of those same banks setting up accounts for offshore companies, or providing essential assistance to do so. Canada's big banks have, as a group, 75 subsidiaries in locales considered to be offshore havens. There are CIBC and Scotiabank branches in the British Virgin Islands, Royal Bank affiliates in Jersey, an arm of the Bank of Montreal in Luxembourg and a TD presence in Bermuda and Barbados, for example. Tax havens aren't entirely a financial Wild West. Over the years, they've brought in measures in response to concerns about money laundering (though those rules are often easily circumvented). In many jurisdictions, someone setting up an offshore corporation or account must provide a reference letter from their bank at home. Sometimes called a "letter of good standing," it's a document that typically confirms that a person has satisfactorily had an account for a number of years. Canadian banks say such letters are routinely requested for a host of reasons, most having nothing to do with offshore dealings. "Signing letters of good standing has nothing to do with where the money is going," said CIBC spokesman Kevin Dove. "It's just stating that you are a client or this individual is a client and not in default." But CBC News has found cases amid the leaked offshore records where it's clear the banks were providing reference letters to be used for offshore dealings. CIBC, TD and Bank of Montreal officials signed those letters, all addressed to a firm that sets up offshore corporations in the British Virgin Islands. The wording of all three letters is nearly identical, and appears to have come from a template found among the leaked files, authored by offshore services agency Portcullis TrustNet. "We write in connection with [our client], whom we understand wishes to utilize your services as a company service provider," all three letters start off. In other cases, banks provided reference letters, apparently unwittingly, that were used for offshore businesses that ran into trouble. RBC wrote one such letter in 2008 for a director of Future Growth offshore mutual funds, months after the funds were the subject of a cease-trading order from the Ontario Securities Commission. TD Bank provided a statement of good standing in 2002 to Greg Cyr, a B.C. man who was wanted on a 14-year-old charge of narcotics possession and who set up an offshore company to quietly buy real estate in Victoria before he disappeared the following year, amid evidence of underworld connections. In a statement, Royal Bank said it could not comment on individual cases. But in general, "when requested, we may provide a letter of account in good standing," the bank said. "Clients may require such letters for a variety of reasons.… Letters of good standing attest to our relationship and dealings with an individual client, to the best of our knowledge." Wiring money has never been easier — even to and from a tax haven — and it helps that Canada's big banks have so many subsidiaries in jurisdictions considered to be offshore centres. Amounts of $10,000 or more are recorded by a federal tracking program, but the program's mandate is to curtail money laundering and terrorist financing, not tax evasion. The leaked tax-haven records are full of examples of clients wiring money between offshore and Canadian bank accounts. In other cases, money is wired between two offshore locales via Canadian financial institutions, which serve as an intermediary or "correspondent bank." In one example, a company controlled by big-time Toronto swindler Peter Sabourin sent funds in 2004 from a Scotiabank account to the British Virgin Islands to set up an offshore corporation. At the time, it was publicly known that Sabourin was being sued for millions of dollars in fraud (the plaintiffs won in 2007). The money that goes through tax havens is not necessarily illicit. But Michael Hudson, a senior editor at the International Consortium of Investigative Journalists, said that "dirty money often goes through big banks." "There are many rules that require banks to know their customers and to do anti-money-laundering checks," he said. "The question is, how aggressively they do this and how often they turn a blind eye?" 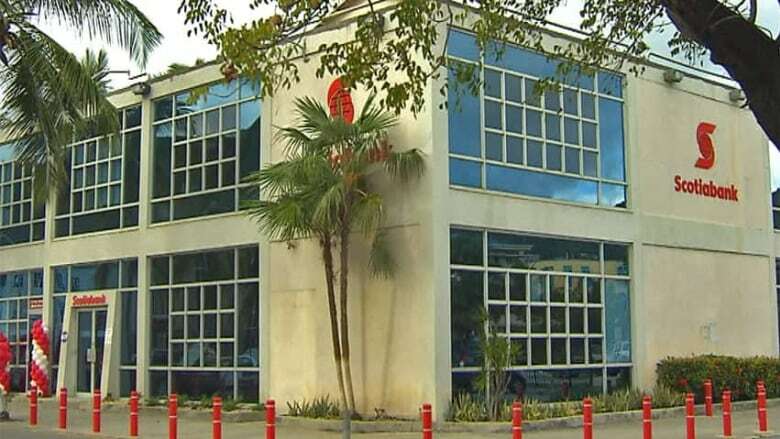 Asked about the various ways it plays a role in the offshore world, Scotiabank said in a statement that it has "well-established know-your-customer practices, as well as processes to monitor accounts for unusual activity and report suspicious activity to the proper authorities." The statement continued: "Scotiabank operates with integrity and is committed to operating at Canadian compliance standards or higher in every country where we operate." Canada's big banks are well placed to supply the documents needed to open an offshore bank accounts or to wire money into them. And because the banks have so many branches in offshore jurisdictions, they sometimes provide the offshore accounts themselves. In an episode documented in the leaked offshore files, a Scotiabank manager at the bank's British Virgin Islands subsidiary contacted local offshore services provider Commonwealth Trust in 2007 and set up meetings with its staff to try to drum up business from offshore corporations needing bank accounts. "Scotiabank actually just contacted us to see if we would refer clients to them for bank accounts," a Commonwealth Trust employee wrote in a Jan. 31, 2007, email. "They are coming to meet with [a colleague] to give more information about their service." Not publicly known at that point, however, was that Commonwealth Trust was under investigation by the country's financial regulator for breaches of anti-money-laundering rules and had received an order the same day requiring it to take major corrective action. Regardless, Scotiabank's efforts were largely in vain. Staff at Commonwealth Trust expressed in multiple emails to each other that the Canadian bank's know-your-client policies were "extremely stringent" and "inflexible." Because of that, a boss wrote, "I wouldn't do business with them." The files show that Royal Bank, too, petitioned Commonwealth Trust to refer clients, albeit back in 2001. One Commonwealth Trust client who opened an account at Royal Bank was the Future Growth group of mutual funds, which used an offshore account at Royal Bank's branch in Jersey, in the Channel Islands, until 2004. The mutual funds were later the subject of regulatory investigations in Ontario and Quebec. CIBC offers offshore accounts as well, and their clients have come under scrutiny, with account-holders at the bank's FirstCaribbean subsidiary the target of an ongoing probe by the U.S. Internal Revenue Service into possible tax evasion. As part of the IRS investigation, an agent alleged in court documents filed in late April that in one instance, "tens of millions of dollars" were transferred into and out of the U.S. using numerous accounts held by an American taxpayer and by several shell companies he controlled; the taxpayer never reported any income from the transactions, the IRS alleged. In a half-dozen other cases, accounts at FirstCaribbean — which operates in 18 Caribbean countries — were used to funnel money by people charged with or convicted of crimes including tax evasion and conspiracy to launder money, the IRS said. When wiring money is not an option, credit cards provide a way for people to spend their offshore money while sidestepping the taxman. "This goes on all the time," said Raymond Baker, president of Global Financial Integrity, a U.S. non-profit that campaigns to stop illicit movements of money. "You can open an account in, for example, a Caribbean tax haven and you can get the bank that is handling that account to issue you a credit card.... In effect, you're buying with money that has been accumulated in a disguised corporation in a tax haven." As the leaked offshore records show, a couple of Canadian banks were commonly cited options. When contacted by clients for guidance on where to set up a bank account in the British Virgin Islands, offshore services agency Commonwealth Trust often replied with a boilerplate email citing some of the services provided by different banks. In one such email dated Aug. 25, 2009, CTL noted that CIBC subsidiary FirstCaribbean International Bank offered "secured credit cards" to clients. "Arrangement may be made whereby the credit card account can be paid off in full each month out of the main chequing or savings account, thus allowing the credit card to function similar to a debit card," the email said. In a separate case, clients using offshore credit cards furnished by a different Canadian bank came under scrutiny. In the late 1990s and early 2000s, the U.S. Internal Revenue Service named RBC clients, and those of several other global banks, in an investigation into use of offshore credit cards. RBC had advertised its accounts as "a safehold" providing "confidentiality and financial advantage."